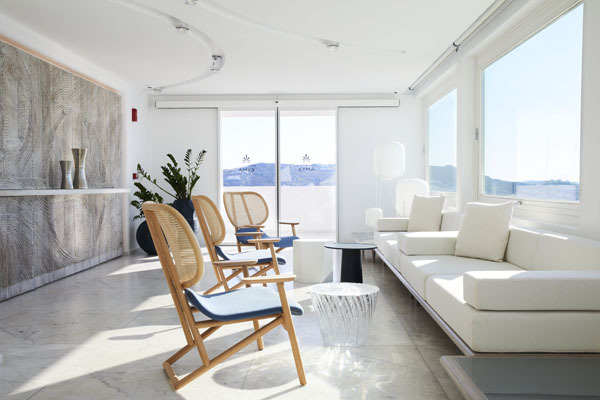 Mere minutes away from the port of Mykonos lies Myconican Kyma—a Myconinan Collection property located in the heart of the enchanting Grecian Island of Mykonos. The intriguing Kyma is set back from the road on a small hilltop, overlooking the iconic Alefkandra windmills, adjacent to its sister properties: the Myconian Korali and Myconia Naia. 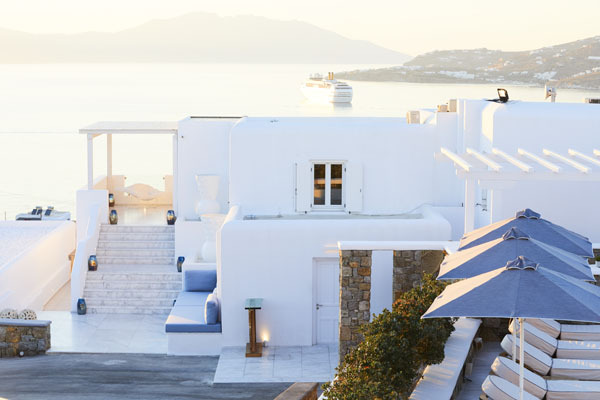 Today, this family-owned collection of hotels is run by Marios Daktylides, who continues his parents’ tradition of maintaining luxury, five-star boutiques throughout this idyllic island. 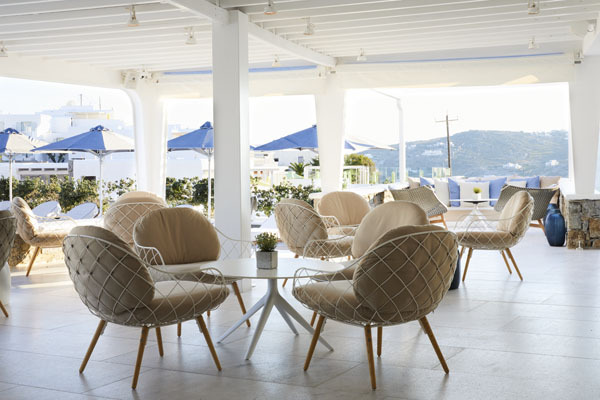 The Kyma, which means “wave” in Greek, is one of the latest outposts for this hotel collection. It is elegantly decorated in true Grecian fashion with bright white lights and blue colors throughout the property. 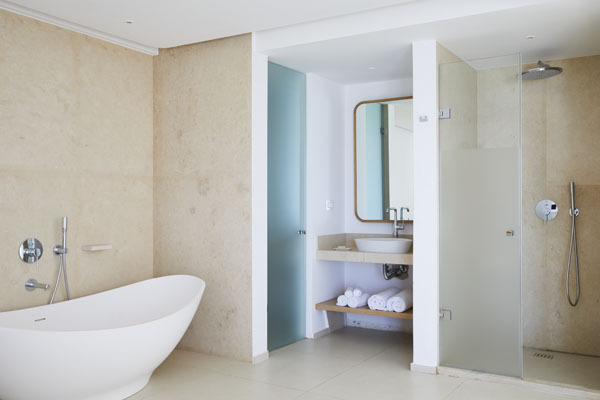 Many of the rooms are adorned with their own private pools overlooking the stunning blue water. The suites at the Kyma are elegance personified. This property offers two types of suites—some having King or Twin beds including rain showers, private pools and Jacuzzis. The Kyma particularly, out of all of the other properties in the sprawling collection, is known for being a design hotel—a point that is made clear in every elegant line, painting, or fixture strewn throughout this unique property. The food and beverage program is at the heart of what they do. The hotel forges a special connection with the type of food it serves in their three dining concepts and aims to produce the highest quality of dishes at their properties. The program director and chef meticulously selects the best of their freshest raw materials, such as fish, meat, poultry, vegetables and herbs. All of these products are either produced in their private farm or from other vendors, selected exclusively by the family. Guests dine for breakfast, lunch and dinner at the American-style steakhouse on property that prides itself on its fine grilled meat selection. This particular menu, along with the other restaurants on the overall property, contains items with the highest quality of ingredients that are locally sourced. Dinner selections include lighter bites like the tuna tartare with citrus yuzu and a tasty fresh green salad. Larger entrees include the crispy pork belly or the signature ribeye steak cooked on the outdoor grill on property. At the helm of the beverage program for the three properties is Irina Marouli. At the Kyma, visitors will find George’s Bar which serves guests from dusk till dawn. In the morning, the bar offers all of the coffee classics, such as traditional Greek coffee to latte macchiato and the refreshing cappuccino freddo; as well as juices and refreshments. As the day progresses, so does the menu, where cocktails become front and center. If you’re dining in the steakhouse, you might very well be welcomed with a specialty cocktail such as the Aperol spritz, among others, that Marouli and her staff have concocted to please their thirsty guests. Next door at the Korali, lies the Mediterranean restaurant that serves traditional Greek cuisine ranging from Horatiki salad to grilled octopus to a dish comprised of quinoa, salmon, cucumbers and dill. Adjacent to the Korali is the Naia property, which is best known for its Sunset Cocktail Party that goes on every night from 7-9pm. A sweeping, inventive cocktail menu is offered in its open air patio, where hotel guests can relax, sip and take in one of the most breathtaking sunsets over the mystical Aegean Sea. The Naia’s restaurant is Italian-themed, with tables and chairs lining its beautiful pool. The menu showcases items such as the sea bass carpaccio with seaweed salad and the sea bass with spinach and cannellini beans. Connecting the Kyma, and its sister properties, the Korali and Naia, resides the luxurious Satori Thalasso Spa. The spa offers a variety of treatments including traditional massages, treatments and couples treatments. At the heart of its spa’s menu is their offering known as Thalassotherapy. This particular treatment takes guests through a series of five therapeutic pools before ending up in a sauna. This is meant to help benefit people with such ailments as painful joints, back problems, arthritis, osteoporosis and water retention. No matter if the objective of a vacation is to relax, to dine on international delicacies, or to indulge in total luxury, the Myconican Collection including the Kyma, Korali and Naia contain every aspect of many different indulgences that could create an amazing, personalized experience.